READING, Pa. -- Albright head coach John Marzka referred to the Lions NCAA playoff opener against Norwich as the octagon. Two teams enter, and only one team emerges. On Saturday, that team was Albright as the Lions cruised to a 49-0 victory over Norwich at Shirk Stadium in the school's first-ever home playoff game. 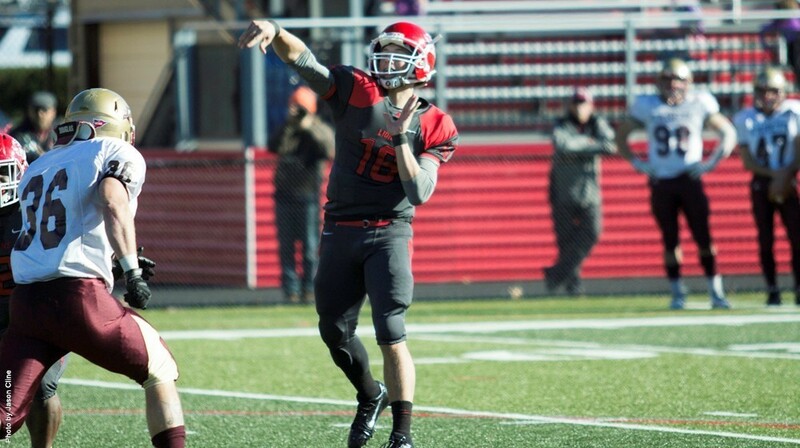 Freshman quarterback Mike Knight delivered most of the blows for the Lions as he tossed five touchdown passes and also scored a rushing touchdown as Albright scored its most-ever points in a playoff game. He finished the game 11-of-19 for 259 yards and five touchdowns and added 31 yards on the ground. Vinny Williams and Gerrod Gainer were the major benefactors of the passing of Knight as each hauled in two touchdown passes. Williams caught six passes for a season-high 119 yards and two scores, while Gainer caught three passes for 100 yards and two touchdowns. It marked the first time this season that Albright has had two receivers top the 100-yard barrier in the same game. Sophomore Chris Dawson led the ground game as he notched his second straight 100-yard game as he had 103 yards rushing on 16 carries. He had a 20-yard rush in the third quarter in which he barreled over a Norwich defender before being pushed out of bounds. Albright accumulated 544 yards of total offense, which marked its second-highest output of the season behind only the 584 yards gained against Wilkes. The Albright defense, which entered the game ranked 29th in the nation in scoring defense, posted its first shutout of the season and held Norwich to 294 yards of total offense. Senior Steve Barroso notched seven tackles, including a sack, to lead the Lions, whileJamal Hayden, Rich Kuhn and Isaiah Baylor each recorded a sack. Albright, which improved to 10-1 on the season, wasted little time in getting on the scoreboard as it took the opening drive 52 yards to the end zone. Knight found Williams on a 47-yard completion which took the Lions to the Norwich 6-yard line and he capped the drive two plays later with a 6-yard scoring run. Norwich, which saw its season end at 6-5, drove to the Albright 24-yard line but Malik Gilmore blocked a 41-yard field goal attempt to end the threat. The Lions responded two plays later when Knight connected with Gainer on a 78-yard scoring pass that increased the Albright lead to 14-0 with 9:50 to play in the opening quarter. Darius Johnson recovered a fumble on the Cadets next drive and Knight connected with Williams on a 23-yard scoring strike three plays later to increase the lead to 21-0 with 8:08 to play in the first quarter. The Lions increased the lead midway through the second quarter as Knight found Gainer from 16 yards out to push the lead to 28-0 with 6:54 to play before halftime. Albright was not finished with its offensive assault in the first half as the Lions went 34 yards in four plays capped by Knight connecting with Williams on a 7-yard touchdown to give Albright a commanding 35-0 lead at halftime. Norwich opened the second half with a 17-play, 56-yard march but it ended when quarterback Philippe Hazinet fumbled on fourth down and the Lions regained possession. Dawson rumbled for 20 yards and Knight hit Williams for 19 yards and then connected with Malik Jackson for a 17-yard scoring play to extend the Lions lead to 42-0 with 2:18 remaining in the third quarter. Albright's final touchdown came on a 54-yard scoring run by quarterback David Gavrilov to give the Lions a 49-0 lead with 9:16 to play. The Albright defense turned away the final Norwich scoring opportunity of the game by stopping the Cadets on a fourth down play from the Lions 5-yard line. Albright advances to the second round of the NCAA Playoffs where it will meet top-ranked Mount Union on Saturday (Nov. 28) at a time and site to be determined. The Purple Raiders defeated St. Lawrence 55-23 to advance to the second round.